With row after row of glistening, serrated teeth, a mouth as wide as its body and an electrical sixth sense to track down prey, sharks are easily the most terrifying creatures of the sea for most people. Much of that fear is misplaced, however. Humans just aren’t on the menu of most sharks. George Burgess directs the International Shark Attack File, the biggest and most comprehensive listing of shark attacks in the world. He says even with millions of people around the globe splashing around at the beach, waiting for breakers atop their surf boards, diving down into coral reefs and pulling their fishing nets from the sea, there are usually fewer than 75 shark attacks each year. “The fact is that if all species of shark were interested in grabbing human beings, I wouldn’t be talking about 75 attacks a year. I’d be talking thousands and thousands,” Burgess says. “In Florida if you ride an airplane or helicopter along the shoreline, you’ll see sharks swimming in and amongst bathers on a day-to-day basis,” without incident. Although they are very rare, shark attacks do happen and North America gets more than its fair share. In a yearly survey of shark attacks taken for 2000, the United States experienced 51 of the year’s 79 attacks recorded worldwide. Most of the U.S. attacks occurred in Florida where the beach-going population is high. The 2000 stats represent the most attacks ever recorded in the 40 years that researchers have been keeping track. There were 10 fatalities in 2000: three in Australia, two in Tanzania, and one each in Fiji, Japan, New Guinea, New Caledonia and the United States. 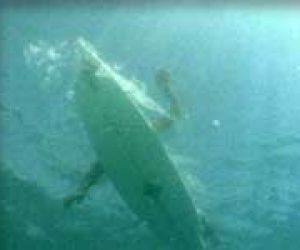 For 1997, the International Shark Attack File lists 56 unprovoked shark attacks. More than half of those took place in North American waters and 10 were fatal. Unprovoked shark attacks in Canada are extremely rare, but they do happen. The earliest shark attack ever recorded here happened in 1851 and involved a thresher shark — a half-metre-long shark with a long, graceful tail shaped like a sickle. A more recent attack, in 1987, probably involved a spiny dogfish — a metre-long, spine-covered shark, common to the mid-Atlantic. Shark Attack File records indicate that neither of these attacks were unprovoked. Burgess says two common ways of provoking a docile shark are pulling on its tail and removing a fishhook from its mouth. “There have only been two unprovoked shark attacks in Canadian waters, the first one being in 1972 off Vancouver Island, Port Hardy, and involving a spiny dogfish as I recall,” he says. “The other one was in 1977. A scuba diver off Newfoundland’s Avalon Peninsula apparently was bitten by a blue shark. That’s the only one that, by most people’s definition, would really be considered a ‘shark attack’.” Thankfully, there have been no fatalities here. If sharks don’t normally attack humans, why do they come after us at all? Burgess says the answer’s simple: sharks make mistakes. “Sharks often grab people in the heat of battle. They’re fighting the currents and undertow and breaking waves. They probably make quick decisions and go after what they think is a mullet and discover that it’s a human foot.” But most sharks quickly realize their error and let go. “No predator worth its salt is going to go after an item that’s twice its size. So these are clearly cases where the shark has made a mistake.” Unfortunately, even if mistakes happen, the results can still be deadly. The jaws of even a small shark can do a tremendous amount of damage to major veins and arteries and, if not treated immediately, a victim can bleed to death. Despite the increase in the number of reported shark attacks, the number of sharks in the world’s oceans is actually decreasing. “The real story isn’t ‘Shark bites man’,” Burgess says. “It’s ‘Man bites shark’. We’re knocking off sharks all over the world, in some cases severely.” In fact, he estimates humans kill about 300,000 sharks each year for every one of us that dies following a shark attack. This is a conservative estimate, according to some other researchers, who suggest the yearly shark death count is 70 million, by net catch alone. Most, but not all, sharks die in trawling nets, unintended victims of our appetite for seafood. In 1998, a great white shark washed up on a South African beach. Biologists say it was probably sick and dying. But almost immediately, terrified beach-goers set in on the 4.4 tonne beast with anything heavy they could put their hands on. In minutes, they beat the shark to death. Burgess pleads for understanding of the sharks, asking people to recognize the oceans as a foreign and threatening wilderness, where sharks simply reign as king of the food chain. Even though one of the best ways to get to know sharks is to dive among them, Burgess says he doesn’t like the idea of eco-tourism operators feeding sharks around throngs of eager divers. 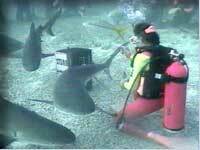 The feeding shows disturb the distribution of sharks around the ocean. They also train the fish to associate divers and their boats with free handouts of food. That’s just plain dangerous for every other diver out there. Worst of all, he fears for the sharks themselves if a person is ever injured at one of these video-camera-happy tourist traps. “You know what’s going to happen. That video and those stills are going to hit the press, they’re going to hit every tabloid TV show, they’re going to make every tabloid press. And you know who’s going to be the bad guy in all that. The sharks are going to be blamed. The ‘Jaws’ image is going to be reinforced.” With shark populations shrinking in many parts of the world, that’s the last thing this graceful ocean predator needs.